Robb Sandagata is an artist, musician, and art educator. He was born in New Haven, CT and graduated from Sarah Lawrence College with a concentration in sculpture. After several years in New York City, he relocated to southern Arizona, where he received a Master’s Degree in Secondary Education and taught high school art. 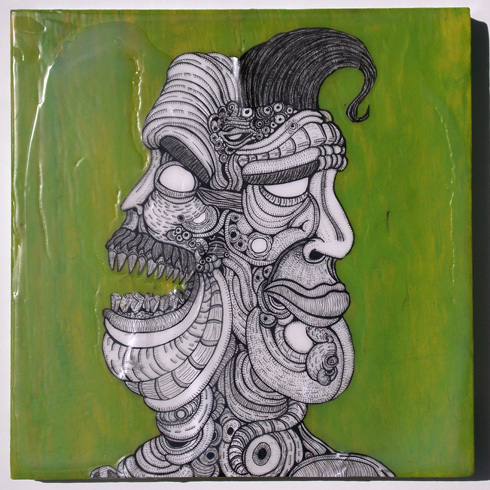 After relocating to Massachusetts in 2009, he re-focused his art making on drawing and mixed media. His work combines contemporary narrative illustration with a surreal infrastructure of experimentation, biomorphic form, and degenerate comic art. An undercurrent of dark humor partially obscures the serious intentions and deeper meanings of the work.